Back when Modiphius announced their Rise of the Black Sun Campaign for Achtung! Cthulhu Skirmish, there was a question about the main rulebook for the game. I did a small hunt, but didn't find anything. Reason was, the main rulebook apparently wasn't out yet. Well, that's not the case anymore. The Acthung! 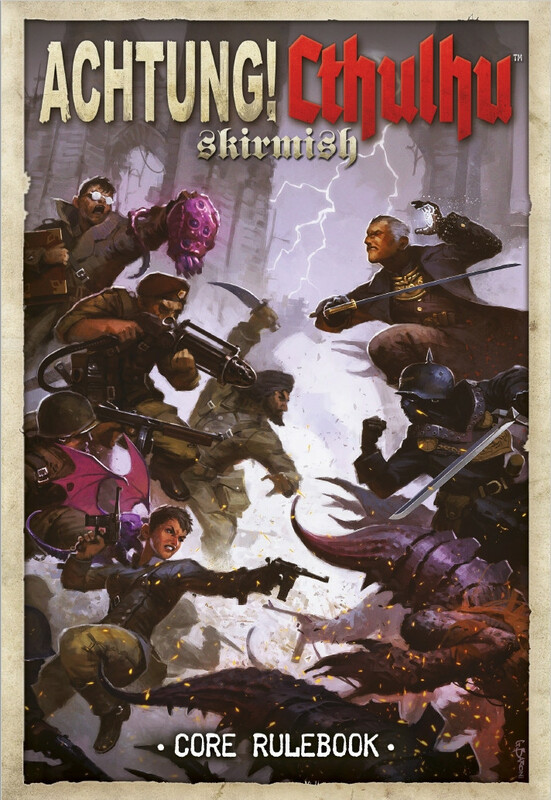 Cthulhu Skirmish main book is available now. The system uses a version of the Dystopian Legions rules from Spartan Games. Though, instead of steampunk forces, it's WWII mixed with the Cthulhu mythos. So you've got Shermans versus Deep Ones, Tigers teamed up with Mi-Go, and other mash-ups that (thankfully) didn't actually happen during those dark days of the '40s. As the fight continues and the Mythos Influence level rises, across the battlefield, strange things will begin to happen that will alter the outcome of your games. Learning to harness this power to your advantage will be key. The game book is available in print as well as .pdf format.